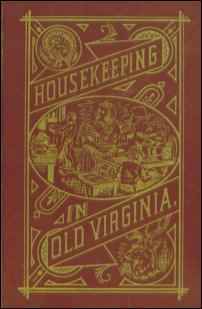 Housekeeping in Old Virginia Containing Contributions from 250 of Virginia’s Noted Housewives Distinguished for Their Skill in the Culinary Art and Other Branches of Domestic Economy. Sadly for us (and certainly for me as a writer with a nose for a good story) we will never know precisely how Marion put her book together. Or why. Did she feel that women had been neglected and deprived by the War, and wished to lift them up by offering them a ray of homey hope? Possibly. What is very clear is that she was educated (we have no biography to inform us, only her fluid prose), organized (the book is a masterpiece of what today might simply be a computer “cut and paste” but in her time would have required hundreds of hours of laborious transcription, after as many hours of selection and collation). She reached out (we do not know exactly how, because, darn it, there was no Facebook!) to “two hundred fifty of Virginia’s noted housewives” and gathered their many recipes for foods, medicines and cleaning potions, (all names listed in the beginning of the book and each contribution meticulously attributed), and put these together in a large (530 page) hardbound book that was published (her work must have begun well before the publication year) by John P. Morton of Louisville, Kentucky (how did she know of the company?—today such a contact would be only a key tap away, but then…?). Morton, who had once been a humble bookstore clerk, had built up his own business, with an entrepreneurship matched by Marion’s own, and printed “textbooks” of which Housekeeping in Virginia was surely considered one. Marion, granddaughter of Patrick Henry, and her in-laws, were beyond a doubt upper class Virginians, and had connections. One source records that the Tyree family kept their doors open to the wounded and ailing during the Civil War, and Marion would have been there to help. Her mother-in-law was a Quaker, a group known for its practice of good deeds (including participation among some in the Underground Railroad). I am very much pleased with it. Her statement is followed by others, from the wife of the US Secretary of State, the Governor, and three senators. There are three sections to Marion’s book (I am calling her by her first name because I want us to envision her as a woman, not only as a writer and editor). The first and by far the longest consists of food preparation tips and recipes organized by category, beginning with the all important Bread, and ranging from meat to cakes to wine and the first known mention of what used to be a purely Southern drink: iced tea. In my youth, iced tea was unknown in the North and was brought to a high art, with its own special spoon, in the southern region where I grew up. Next is advice for the “sick-room”—a word that has all but disappeared as our lives have become more medicalized and our houses far smaller. The last chapter contains housecleaning hints, from how to destroy bedbugs to restoring old clothes. The recipes are interesting for several reasons. One is that there was obviously a statewide (probably nationwide) agreement as to what was meant by words like “flour” and “sugar.” We know that white flour, the purer white the better, would come to dominate, but we can speculate that for a housewife in 1879, flour was beige, with flecks of bran. Molasses today can be anything from blackstrap to a rather light syrup. We assume that, more than a century ago, molasses would have been that thickest darkest byproduct of sugar refining, and sugar itself would have been less than white and less than pourable. From my childhood I recall that sugar had a tendency to lump, and I suspect that in Marion’s day, the very fine, snow-white product we know (and some despise) these days was a still long way in the future. One thing is probably certain, however: the sugar used in Virginia by Marion and her contributors came from Cuba, where slavery (continuing in that country until 1886) and mechanization had made it the cane capital of the world. Clearly wishing to include both common and uncommon foods, Marion has given us a broad, useful picture of what people in 1879 liked to eat and had access to. This includes turtle soup, stews made of the heads of a variety of animals—calves, goats, and pigs—tongue-and-prunes, ox hearts, beef collops (not a part of a bovine anatomy but a Scottish dish with oats), something called cymlings (squash, possibly yellow?) and martinas (anyone?). In this plethora of advice and instruction, it is nearly impossible to isolate one recipe that you’d like to try, but I am going with my personal rule: when in doubt, make cake. Use the figs whole, covering them well with the cake [assuming she means the cake batter] to prevent burning. Bake in layers, frosting between each layer. Make as stiff as pound cake [another one of those shared assumptions, that all women know how stiff a pound cake should be]. Cut with a very sharp knife, to prevent crumbling. This recipe makes two loaves. A “housekeeper” in 1879 needed to be able to bake breads and cakes, stew animal heads, concoct sophisticated sauces, preserve fruits and vegetables, protect all foods from grains to dairy products, make and store mayonnaise, butter and cheese, and brew beer, vinegar, and wine. And the male presence is more overt still when we arrive at, to me, perhaps the most fascinating segment of the book: advice for “the sick-room.” In it, the incursion of man-ness is all too obvious as we women are told in no uncertain terms how to comport ourselves when the physician comes to call (“he” is definitely a “he”). We must have everything set up for him so his time is not wasted: “Have everything ready for his admission immediately after his arrival, as his time is valuable and it occasions him both annoyance and loss of time to be kept waiting outside of the sick-room, after reaching the house of the patient.” One does not have the sense that the important, indeed lordly, doctor plans to stay very long. Many of the remedies offered contain ingredients that would shock a modern pharmacist, preacher, or law enforcement officer: opium, wine, paregoric, camphor, and furniture glue were judged efficacious for varying ailments. The illnesses have archaic names redolent of the bygone era: chillblains, chicken cholera, dyspepsia and something called “bone felon” (for which assafoetida infused in vinegar is described as “a painful but effective remedy”). A treatment for “epilepsy” caught my eye and sent me scurrying to the internet, to find, as I suspected, that this old medication is still used widely and respectably, by herbalists, especially the Chinese: the root of a white peony (though “red will do”) scraped and cut into one-inch square pieces and eaten three times a day. Cleaning methods are equally arcane, yet in some ways, not so surprising (at least they are not to be ingested!). They include mixtures to kill rats, red ants and bedbugs, one major ingredient being “corrosive sublimate” (translation: mercury). Other perilous ingredients making up polishes, dyes and cleansers commonly used by our foremothers included lye, alum, ammonia, turpentine, copper, lead, sulfuric acid, opium and chloroform. No wonder the average lifespan was shorter—nostrums meant to cure and clean were silently killing off our ancestors! 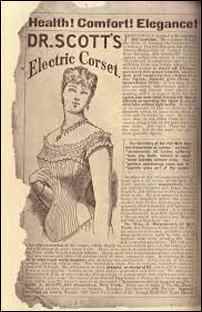 Some of the typical tasks assigned to housekeepers (the woman of the house, not necessarily the hired or enslaved) in 1879 included restoring silk, renewing black crape, making ink (both red and black, presumably for keeping the accounts! ), blacking shoes, making glue, shading glass, cleaning marble slabs, whitewashing, keeping weevils out of the wheat, drying herbs, preparing various waxes—and for hair, preparing oils, tonics, dyes, restoratives, shampoos, and something called bandoline for smoothing the hair and keeping it shiny. It places within the reach of every American housekeeper the principles and practices of the homes of the Commonwealth. Many of these recipes have been handed down from mother to daughter for four or five generations, and have successfully withstood the rivalry of modern dishes. —From the Boston (Mass) Transcript. If two hundred and fifty matrons of Virginia cannot teach their sisters in other states something the sisters don’t know about housekeeping, then cornbread is a failure, and Lady Martha Washington a free and independent American myth. —From the Chicago Inter-Ocean. Though Marion’s book is not illustrated, there is a cover picture that rather unfortunately seems to depict not an aristocratic or merely ordinary woman slaving away, but slaves or servants doing so for her. Doubtless at the time, though, this was realistic. I found a copy HIOV in a thrift store a few years ago and count it among my most prized collections of woman’s lore. Its advice never ceases to intrigue me, and the sense of history it conveys is palpable. Though I can’t kill and skin a duck and won’t use mercury to kill bothersome critters, the book brings to mind long ago scenes of Grandmother’s kitchen and the way things used to be. I highly recommend that you scout up a copy (on the oh-so-useful internet) and keep it, as I do, for a trip back in time, as well as for a gracious plenty of still useable recipes, and sincere, practical advice.